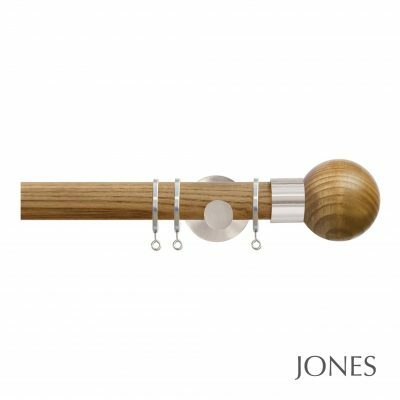 The Jones Strand range of 35mm curtain poles are a popular choice and enable you to achieve a designer look at great value prices. 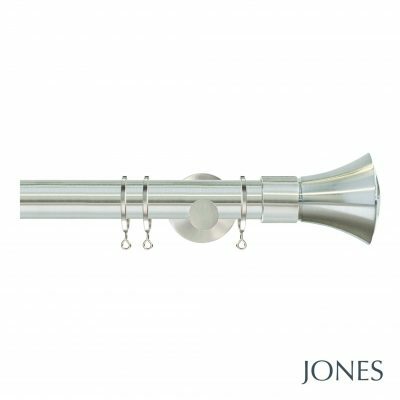 The added value components are a real step up from the high street / DIY specification of components, and the finial designs are sophisticated and stylish providing a real wow factor at your window. 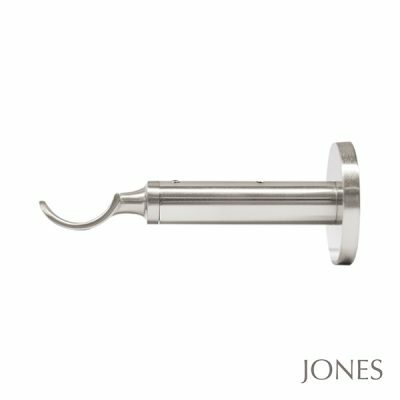 Please view our YouTube video for more information and to see the products in more detail, or read our blog on Jones Strand. 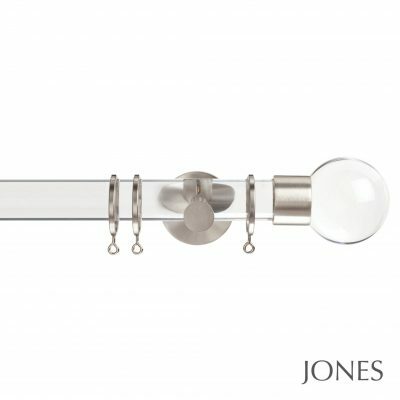 The Jones Strand metal curtain poles are available in a matt nickel, chrome, black nickel and a contemporary rose gold colour. This picks up the copper trend beautifully and can add a perfect finishing touch to your room. 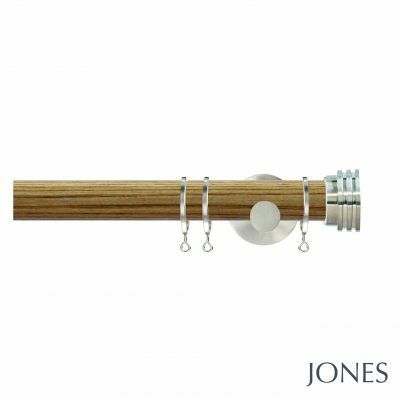 They also have an acrylic pole available in the Strand range and a beautiful oak pole. 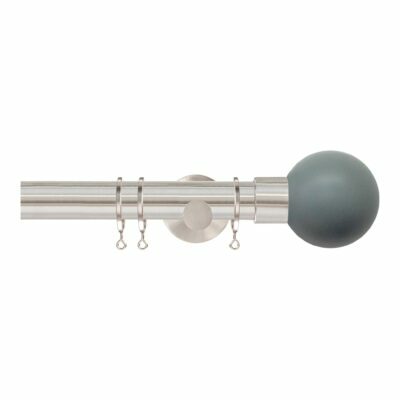 These look great with the metal finials. 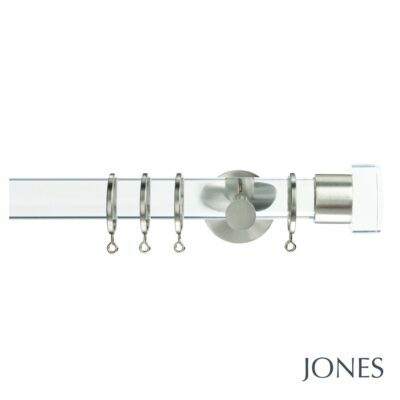 Jones Strand offer 2 bracket sizes and there is also a ceiling bracket option. 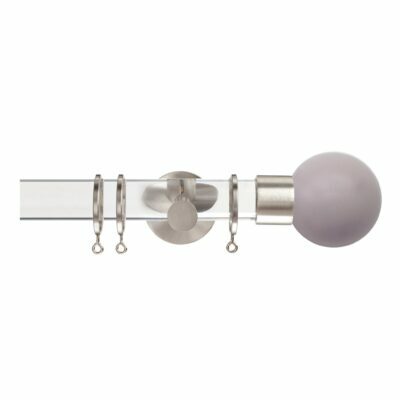 The standard wall brackets are available with a 7cm or 11cm projection. 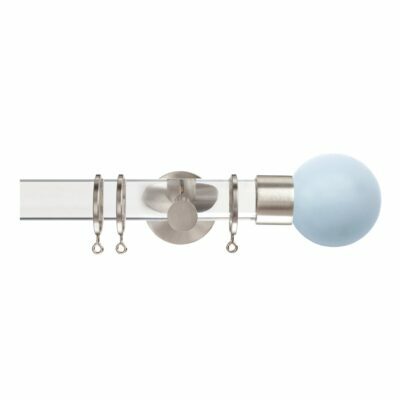 You may wish to consider the 11cm option if you have eyelet curtains, as the natural fold of the eyelet can be quite deep so the 11cm bracket takes the curtain that little bit further away from the wall ensuring the curtain doesn’t rub on the wall. You may also wish to go for the 11cm option if you have a wide windowsill and want the curtains to sit in front of the sill. There is also a passover bracket solution and passover rings are available. This can be useful if you have one curtain you wish to draw from one side over to the other and need a centre bracket. The passover brackets and rings enables this functionality. 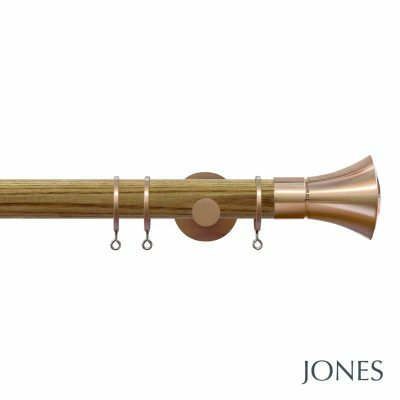 Please call us on 01625 449039 or email sales@thehomeofinteriors.co.uk if you have this requirement as we can pull together a bespoke quote for you (so that you don’t end up having standard brackets and rings that you don’t need). 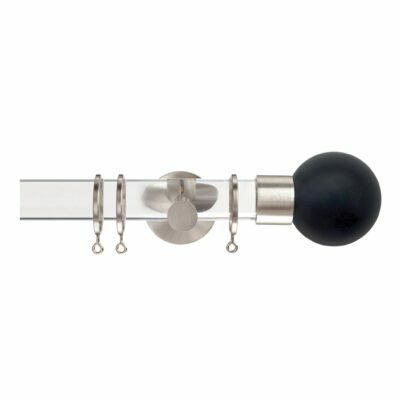 A recess bracket is also available if you are fitting a curtain pole between 2 walls or only have space for a finial at the one end. Again please get in touch if you have this requirement and we can pull a bespoke quotation together to meet your requirements. 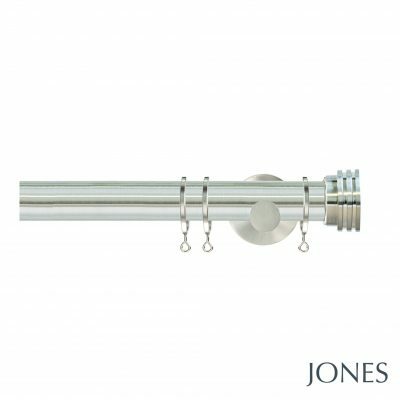 Co-ordinating holdbacks and draw rods are also available to complete the look. 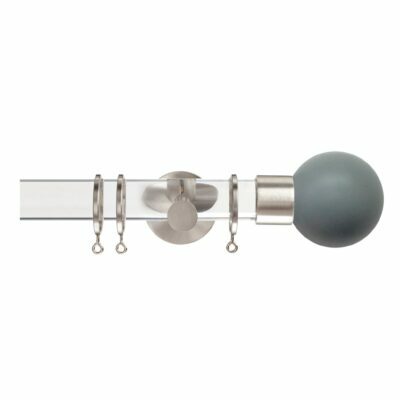 The draw rods attach to the leading curtain hook to enable you to open and close your curtains without touching them. This is ideal for light or delicate fabrics so they don’t get dirty. 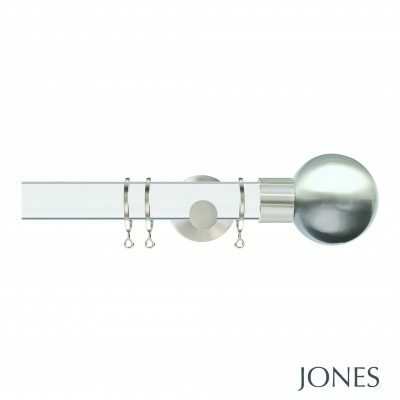 The Jones painted ball finials are truly stunning and pick up modern interiors trends in the colours available. The heather and lead work extremely well with grey and blush colour pallets, and the sky blue works well with nautical / coastal themes. 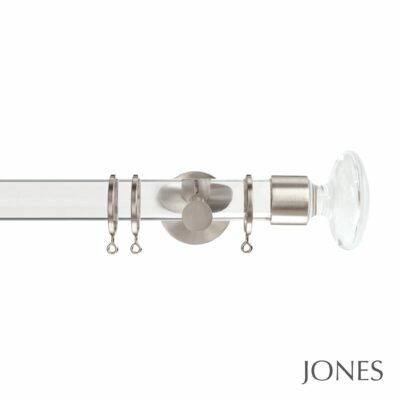 We offer a cut to size service on the Jones Strand curtain poles. 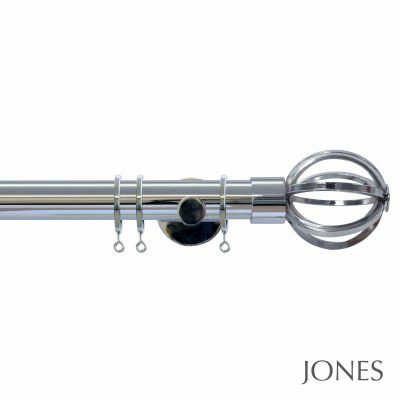 Please add the service to your basket (you will find it as an accessory on each of the product pages) and we will ensure the poles are cut to your exact length. 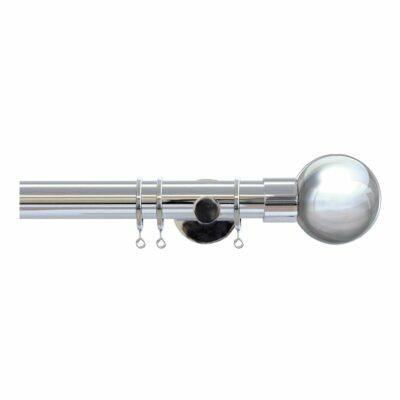 There is a 2 day leadtime on cut to size poles.